His left arm went on with very little modification, just some flex fitting sculpted in around back to get a better position. His right arm though, a whole different story. I started by cutting away the entire elbow joint of the arm I had. All I had left was the Lightning claw and the shoulder joint itself. It took me a while to get it positioned just right. I had to account for the shoulderpad, the new elbow joint and the power cable that runs up the back of the arm. And I was trying to match the pose. Once I had what I thought worked, I pinned it in place and let the glue dry completely. 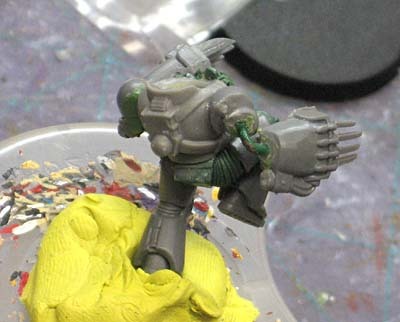 I was going to have to sculpt this arm while it was attached to the body since I had to glue the shoulder in place to make sure I had enough clearance for the shoulderpad because of the huge jump pack he's wearing. What a mess. 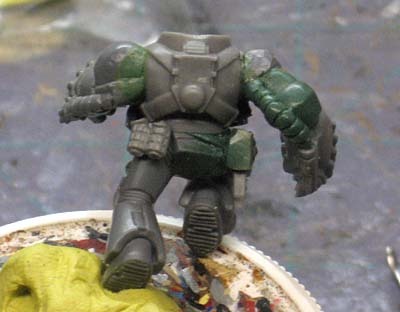 First I sculpted the upper arm armour. Then the lower arm. Then the flex fitting between the joint. Then I moved onto to elbow guard. That was the biggest problem. It took me three tries to get it right. Once I had that done, I added the power cable for the lightning claw that runs along the back. Of course I had to make sure I left enough clearance for the shoulderpad to sit nice and snug on top. Here it is from the back. you can see I've added the grenades and his bolt pistol, filling that out and adding a smaller strap to hold it in place. And the front. Here you can see the purity seals on both sides of his chest plate and the cord that runs down to his waist. The Terminator Honors will hang from that. While it might not seem like anything in this pic, it took me forever to get just the right angle to his right lightning claw. To much twist outward and it looked odd, too much twist inward and it looked odd. Once he's mounted to his base, his whole pose should come together. I know that I have to do some work to his neck to get his helmet positioned just right. 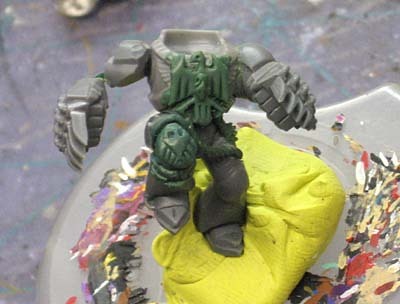 I've already sculpted his left shoulderpad and I've still got his right one to do. Those will be glued on with PVA or white glue so they can be removed later on in the event Forge World comes up with some really nice Raven Guard shoulderpads. I should be able to wrap this whole project up in the next post. Absolutely top-notch work, Ron! I've been following this with great interest since you've began and I'd fantastic stuff - I appreciate the walkthrough, as well. I look forward to seeing more! That's some handle you've got on the Green Stuff there, Ron. Excellent conversion work! I'm really looking forward to seeing your Shrike conversion completed. He's coming along nicely, love the pose. 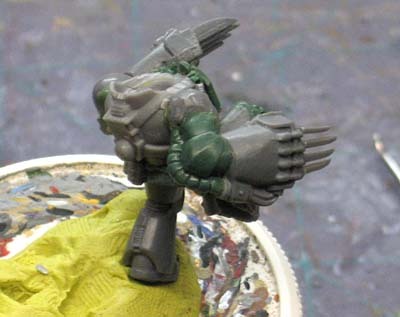 The really nice thing is that the eventual colourscheme (Raven guard) will make all those busy bits blend in together quite wll, leaving a complex but coherent mini. Gorgeous work, as always. Your stuff always inspires me to push my envelope. Thanks guys, I should be able to get him based up and near finished this weekend. Nice work and excellent tutorial, as always. hi ron, silly question are they both power armour claws before you started chopping them? if they are where did the right hand one come from? 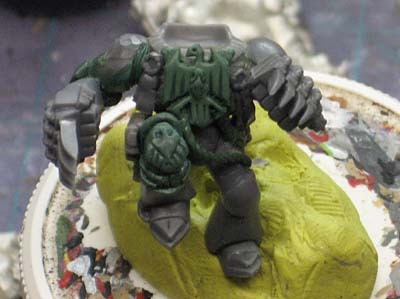 im guessing the left hand (as in models left arm) came from the commander boxset but any suggestions on a right handed power armour lightning claw would be great! millest: Not a silly question Sir. 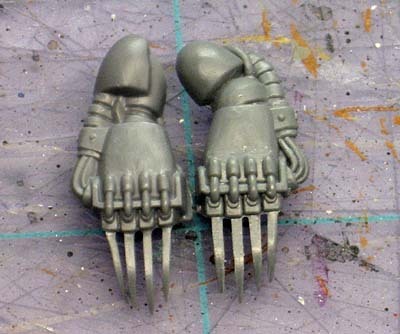 If I remember correctly, they are a set of Space Wolf claws with the iconography cleaned off of them.